"Yummy Japanese dessert and comfort food, good served cold or hot. Japanese desserts are not too sweet, more like European-style." Slice 1/2 of 1 banana and sprinkle 1 tablespoon sugar over it. Chop the remaining bananas and place in a skillet over medium heat; stir and mash until bananas become heated through, are slightly browned, and hold together in 1 ball, 5 to 10 minutes. Remove from heat. Mix milk, rice, egg yolks, 3 tablespoons sugar, butter, and salt together in a saucepan over low heat until slightly thickened and steamy, 2 to 3 minutes. Stir in mashed bananas until well blended and heated through. Remove from heat and refrigerate rice pudding until slightly cooled, at least 15 minutes. Stir whipped cream into rice pudding until well blended. Heat a skillet over medium heat; cook and stir sugared banana slices until sugar has melted and caramelized, 2 to 4 minutes. 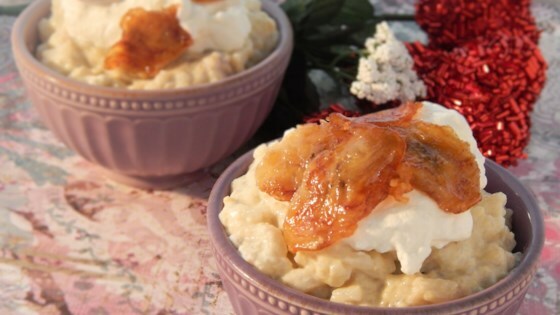 Spoon over rice pudding. I use spray whipped cream. Its easier and takes less time. This is fantastic! We serve it at our B&B and it’s always a hit, even for those that claim not to like rice pudding! Don’t change a thing!